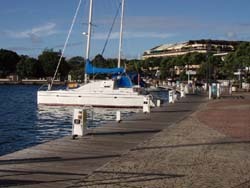 The yacht harbor in Papette is next to a lovely promenade. 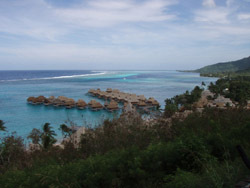 The promenade runs along Tahiti’s main road. It is a bit noisy, but after months of travel in remote areas we liked staying right in the heart of Papette. Mustang Sally was Mediterranean moored – i.e. we had an anchor out in the habour, then backed our sterns up to the dock. By using lines to shore the boat is secured. 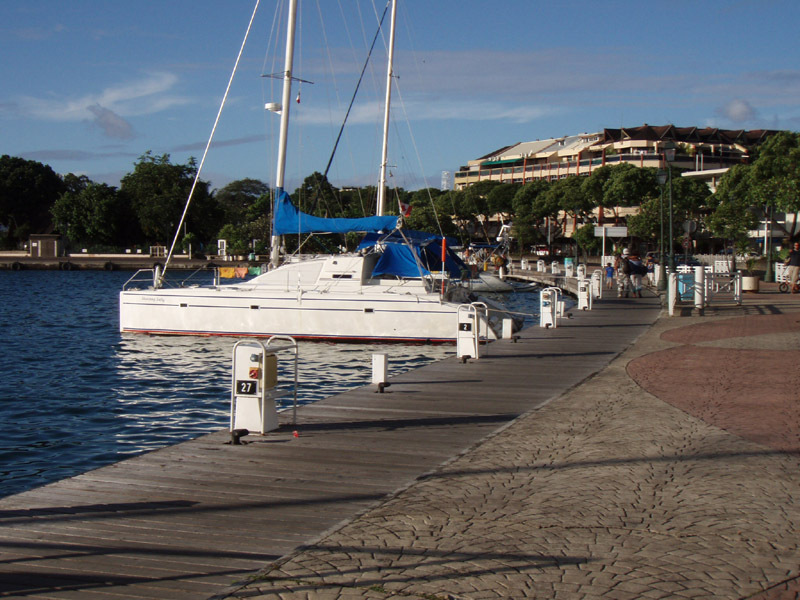 By adjusting the length of the lines we move the boat closer or further from the dock. Close for getting off and on the boat. Far for night time or while away from the boat. Double click the picture on the right to see how it works. I awoke about 5:00 am, just at dawn to the sound of someone on the boat. I yelled out the port hole and heard a splash. Running up on deck I spotted someone in the water, pulling himself up on the dock using our lines. He struggled to climbed out. All soaking wet, he sauntered off with a drunken stagger as if nothing had happened. Perfectly natural to be walking down the promenade dripping wet. In another amusing petty theft story, our friends on the boat Tiger had some shoes stolen from their boat. A week later, the shoes were returned.